Here’s a simple, hearty everyday sort of dish; lentils and spinach are natural companions, and curried seasonings flavor them nicely. 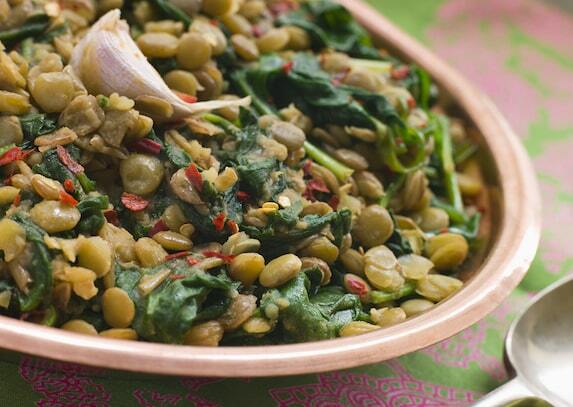 See the shortcut below for making this an even quicker dish using canned lentils. Adapted from Vegetariana. Wash and sort the lentils and cook them until they are tender but still keep their shape. Heat the oil in a large skillet. Add the garlic and sauté over medium low heat for 1 minute or so. Add the spinach leaves, cover, and steam until they are wilted. Add the lentils and the remaining ingredients, except the cooked grains or mashed potatoes, to the skillet. Cover and simmer over very low heat for 20 minutes. This dish is especially good over brown rice or couscous; for a delicious change of pace you can also try it over mashed potatoes. Explore more way to enjoy spinach. Here are more recipes using healthy lentils and peas.